I have always liked to keep my living area fairly clean and since my husband and I bought our first home back in April, this has only increased. I love to try new cleaning products to help keep my home fresh and clean. For my review, I was sent some Naturally It's Clean products to try out including a product for mildew, kitchen and tub & tile. 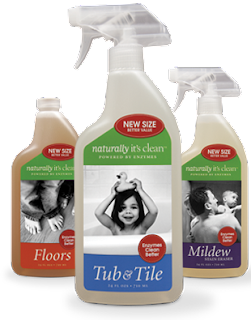 These are enzyme based cleaners that are effective at removing mold and grime. The company first started out in Detroit so of course I love it already! The first one that I tried out was the one for the kitchen. I love to cook so my counters get messy quickly. I sprayed some of this product on my new counters and they wiped clean without any struggle!! I also tried out the tub & tile cleaner. This is an area that I often forget to clean because I do not see it unless I am in the shower. This product was easy to use and got the grime out of the corners of my tub. I very much enjoyed trying out these products and ended up really liking them. Now my house is clean and shiny (for now : ) ).